Wanna turn your home into 3D theater? 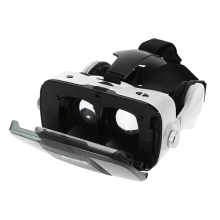 This Virtual Reality 3D Glasses can fulfill all your dreams of watching 3D movies and play immersive games at home. Just with a smart phone, you can turn 2D movies to 3D movies at once, giving you feeling of being in the scene. Push to talk when there is an incoming call. Volume can be controlled during talking, watching movies or playing games. This amazing VR Glasses gives you amazing using experience. Just with a smart phone, you can turn 2D movies to 3D movies at once. Greatly enjoy 3D movies in your mobile phone. Left-right 3D movies should be downloaded if you want to enjoy 3D movies with 3D VR Box. You can place your smart phone on the right side which is convenient to align at the middle line. It&apos;s perfectly compatible with Android iOS Windows smart phones from 4.0 to 6.3 inches. It brings you wonderful experience of playing immersive games with gamepad (not included). 360° Panoramic design takes you into a new world, giving you perfect visual enjoyment. And 120° large FOV gives you perfect visual to watch 3D movies. You will definitely enjoy amazing 3D effect when you download various Virtual Reality apps on Apple App Store and Google Play Store. You must pay attention that you should download some specific applications in Google Play Store to choose the " Split Screen Mode" for a better and correct viewing. Adopting Blue-ray Non-spherical Optical Lenses, it can effectively prevent visual fatigue and dizzy even after long time using which produces enlargement effect, non-deformation, broad vision and strong sense of immersion. Pupil Distance and Focal Distance can be adjusted to have a perfect visual. It&apos;s perfectly suitable for shortsightedness within 600°. Push to talk when there is an incoming call. Volume can be controlled during talking, watching movies or playing games. Flexible headphone can adjust forward and backward which can be adjusted according to head size. Adjust the microphone to pick up the clear sound for a clear communication. Alleviate the stress of the head for a comfortable wearing. Protein and skin-friendly earmuff effectively reduce stress against ears.